There are good teachers and there are bad teachers. A bad teacher will treat what he does as a job and nothing more. A good teacher will recognise the importance of the role he plays in society and will try to fulfil that role in earnest. Then there are gifted teachers. They treat what they do as an art. They are born with a gift and they know their calling when they hear it, or, at least, most of them do. They understand what a difference a teacher can make to a student’s life. They are artists and, like all artists, they are concerned with beauty. Knowledge is their tool and enlightenment is the end-product. A gifted teacher will get so much joy and satisfaction from seeing enlightenment and the dawn of understanding in his or her pupils’ eyes. It is what he or she lives for. That moment of enlightenment is everything. 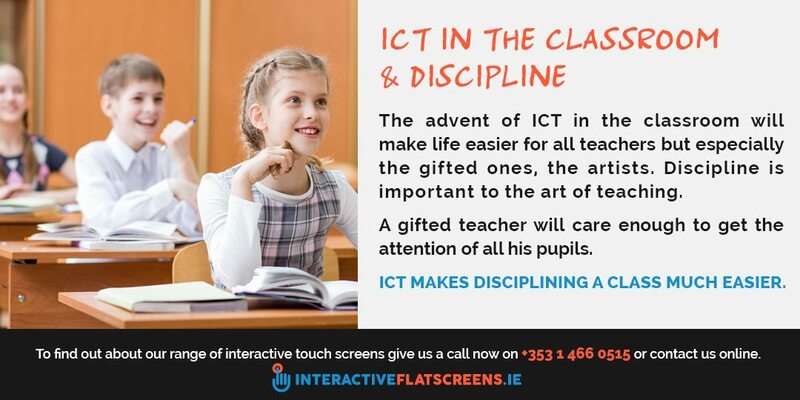 The advent of ICT in the classroom will make life easier for all teachers but especially the gifted ones, the artists. Discipline is important to the art of teaching. A gifted teacher will care enough to get the attention of all his pupils. ICT makes disciplining a class much easier. Most unruly behaviour is caused by boredom and ennui. A more interactive and engaging learning experience will remedy this. The interactive flat screen, used in conjunction with the tablet, will provide such an experience. Using the interactive touch panel will also speed up the learning process. It is so easy and intuitive to use and there is so much information at the teacher’s finger tips that they can spend more time with individual pupils. Developing a relationship with pupils on an individual basis is one of the joys of teaching. As an influencer on the pupil’s future, the gifted teacher will recognise his responsibility and duty to help nurture a talented pupil. Indeed, part of his gift is being able to discover talent and potential. He knows that he might have the next James Joyce or Albert Einstein in his hands. A good example of this aspect of teaching is in the book, The Catcher in the Rye. Near the end of the book Holden, the protagonist, is urged by his English teacher not to drop out of school and to go on to college. He recognises Holden’s potential and doesn’t want to see it wasted. He takes what he does very seriously as he knows he has the young man’s future in his hands. Another part of the art of teaching is the ability to think on your feet. The gifted teacher is so eloquent and knows their subject so well that they don’t need notes. Using the interactive touch screen will add to the fluidity and grace of their teaching. Once a teacher has mastered its use they will incorporate it into what they do with ease. 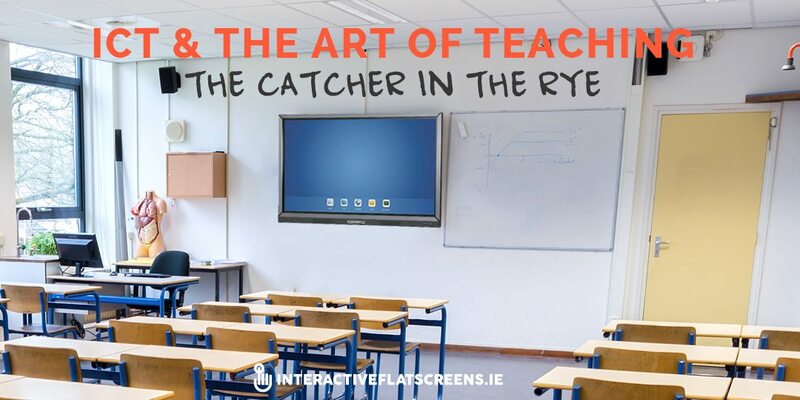 If teaching is a dance, the interactive flat panel is the best partner a teacher can have. There will always be teachers, both good and bad, but everyone should know the magic of having a gifted teacher in their life, if only just for a short time. They are the teachers whom you never forget. They have a presence in the classroom. The presence of an artist. And, if you are lucky, they will extend their art to include you. The advent of the interactive flat screen will only empower them, another tool by which to create enlightenment. 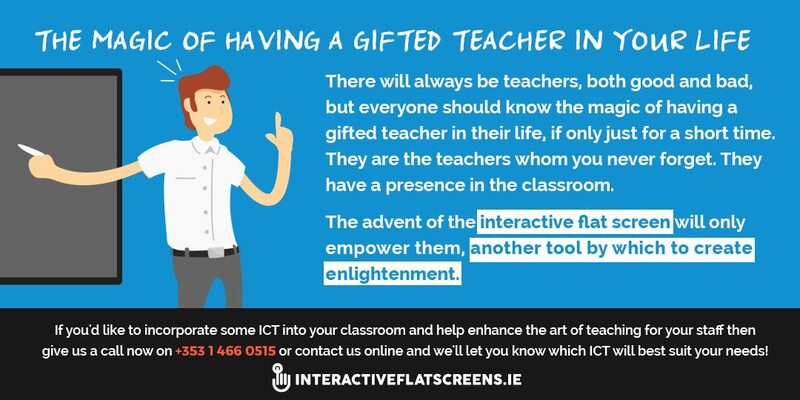 If you’d like to incorporate some ICT into your classroom and help enhance the art of teaching for your staff then give us a call now on +353 1 466 0515 or contact us online and we’ll let you know which ICT will best suit your needs!